What is the Foreclosure Process in Texas? | Machi & Assoc. Home » Blog » What is the Foreclosure Process in Texas? Even after the housing crisis that caused the Great Recession, homeownership remains one of the pinnacles of the American Dream. But for those who have started missing mortgage payments as a result of complications such as job loss, the government shutdown or hefty medical bills, foreclosure proceedings may be a looming threat. If you’re facing the threat of foreclosure, you may wonder what you should expect from the foreclosure process. 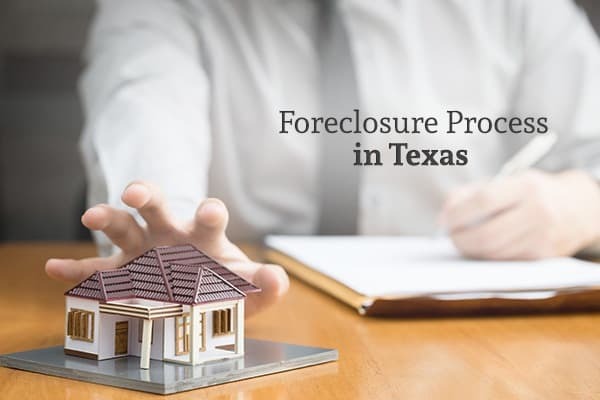 Read on to learn more about how the foreclosure process works in Texas. Most lenders provide their borrowers with a “grace period” of anywhere from a few days to a couple of weeks or more. During this grace period, no late fees will be assessed, and the lender won’t report any late payments to the credit reporting bureaus. And even if you don’t make your payment until after the grace period has expired, the lender may just assess an overdue payment without reporting you as delinquent (and thus lowering your credit score). However, if your mortgage payment is late and you’ve made no effort to communicate with your lender, you’ll be assessed late fees and other penalties in accordance with your mortgage servicing documents once this grace period elapses. Depending on the terms of your mortgage, you may be required to make all your back payments and any penalty payments before you’re deemed “caught up”—which means that even making your mortgage payments in full may not be enough to avoid foreclosure once you have fees or costs tacked onto the bill. During this time, you’re likely to receive a few letters and phone calls from your servicer as they attempt to learn what’s causing you to fall behind. Ignoring these inquiries may seem like the easiest solution; however, pre-foreclosure is often the best time for you to work out any payment alternatives with your lender before your missed payments have a negative impact on your credit. The Consumer Financial Protection Bureau (CFPB) has enacted rules that give all U.S. borrowers 120 days after their first missed payment before lenders may send out a default notice or file a petition for foreclosure. This four-month period is called the “Pre-Foreclosure Loss Mitigation Review Period,” and is intended to provide lenders and borrowers with the opportunity to explore loss mitigation opportunities. A couple of the most popular loss mitigation methods include loan modification and forbearance. In a loan modification, your loan is rewritten to provide you with a longer payoff period or lower interest rate, thus reducing what you owe each month while allowing you to absorb the added costs of any delinquent payments or late fees. A forbearance is essentially a “pause” button that can let you save up your back payments, cash out a retirement account, or take other steps to come up with the money you need to bring yourself up-to-date on your payments. If the 120 days lapses and no deal has been reached, your lender will send out a letter that officially notifies you that you’re in breach of your mortgage contract and will be subject to foreclosure unless you pay off your loan debts. Texas and federal laws require this breach letter to contain some specific information that will explain how to proceed if you’d like to avoid foreclosure. Reading this letter carefully will let you know how much money you need to come up with to reinstate your loan and when you’ll need to provide these funds to the lender. In states that have judicial foreclosure laws, lenders are required to go to court and get a judgment against a homeowner before they gain the title to the house and can sell it at a sheriff’s sale. But in non-judicial foreclosure states like Texas, lenders can gain the title simply by triggering the mortgage’s “power of sale” clause. This portion of the deed grants the lender the ability to repossess the home upon default without having to jump through the hoops of the judicial foreclosure process. If the loan default is not taken care of within twenty days after the lender issues a notice of default, this “cure period” ends, and the lender may list the home at a foreclosure sale. If you’ve fallen behind on your mortgage payments but want to keep your home, Machi & Associates P.C. can help. Foreclosure proceedings can move quickly, and it’s important to seek advice early in the process to make sure your rights are protected. We can work with you to stop foreclosures or help you declare bankruptcy to get out from under your debts and save your house. Contact us to learn more about the services they offer and to schedule a free, no-obligation consultation.